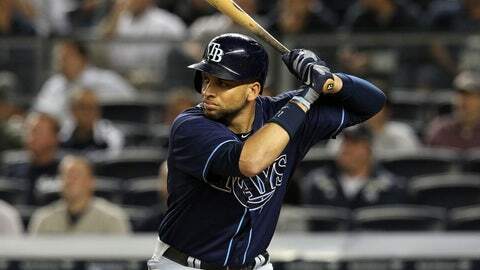 James Loney hit a team-best .299 with 13 home runs and 75 RBI for the Rays in 2013, his first season in Tampa Bay. Their band will be back together, a four-piece collection worthy of gold. None of the Tampa Bay Rays’ infielders won an American League Gold Glove Award last season, but don’t let semantics fool you. Third baseman Evan Longoria, shortstop Yunel Escobar, second baseman Ben Zobrist and first baseman James Loney — the group’s most deserving — were finalists for the honor and major reasons why Tampa Bay owned one of baseball’s most feared defenses. With the Rays announcing Loney’s three-year, $21 million deal Friday — the largest free-agent contract awarded by current ownership — their safety net behind the mound will be secure for another year, with a veteran first baseman who’s part offensive weapon, part Spider-Man at the bag. "I think the last week or so before I signed, I think I just kind of realized, too, where I liked to be and what I knew was something I liked," said Loney, who considered similar offers from the Pittsburgh Pirates, Milwaukee Brewers and Houston Astros. "I knew the team was always going to be competitive. When you have those kind of factors, it definitely makes it a lot easier." There’s no other way to slice this: Loney’s return is a win for him and the Rays. Earlier this winter, as baseball’s hot stove sizzled, many names were tossed throughout the Twittersphere as options if Loney were to chase larger free-agent dollars elsewhere: Mark Reynolds, Kevin Youkilis, Justin Smoak. Loney, all along, was the Rays’ best option. Tampa Bay took a flier on him with a one-year, $2 million deal before last season. The returns were plenty and pleasing. For the Rays: They received a complete, consistent talent. Loney hit a team-best .299 with 13 home runs and 75 RBI. He produced a .348 on-base percentage (his highest since 2009), a .430 slugging percentage (his highest since 2008) and a 2.7 wins-above-replacement figure, the best in his eight-year major-league career. Rays manager Joe Maddon, throughout the season, praised Loney’s sure glove. For Loney: He enjoyed a career renaissance, one that resulted in a considerable bump in his bank account. Quiet and reserved, he blossomed within the clubhouse as the season progressed. He reportedly sought a three-year deal worth between $27 million and $30 million this offseason, but the $5 million increase in annual salary is a nice chunk of change for someone who never made more than the $6.375 million he received from the Los Angeles Dodgers in 2012. "He’s a security blanket for the whole infield," Maddon said. "I know every one of them will tell you how happy they are to have him back. … He’s a man’s man. You can talk to him and tell straight up, ‘Nothing phony about this guy.’ So for all those different reasons, it’s a great get." Add Loney to the list of success stories produced by Maddon and Andrew Friedman, the Rays’ executive vice president of baseball operations. The Miami Marlins traded Escobar for infielder Derek Dietrich before last season, and the Cuba native became another player that glowed with Tampa Bay’s Midas touch. The infield’s success, with those two examples as proof, is due to savvy scouting and sound development within an atmosphere that promotes a positive result. Sure, the Rays have had some recent misses — the Roberto Hernandez experiment never panned out as well as hoped — but Loney is further proof of Tampa Bay’s ability to polish diamonds in the rough. The Rays do it out of necessity. They do it for survival. They do it to stay competitive in the rough-and-tumble AL East, where complacency kills. "They were a huge part of our success last year," Friedman said of the Rays’ infield. "We anticipate them being a huge part of our success next year. They’re extremely gifted in all facets of the game. If you look at the offensive production, the defensive production, just the total game — we feel like we have one of the more productive infields in baseball. That’s obviously a good thing and something we were highly motivated to try to keep together." With Loney’s addition, a sigh of relief should lift from the pitchers’ corner of the Rays’ clubhouse. Longoria, Zobrist and Escobar are proven assets, and Loney’s return means there will be no feeling-out process at first base. The comfort factor, all around the horn, should be present from the start of spring training. Longoria and Zobrist own five All-Star appearances between them. Escobar, a seven-year veteran, brings flair. Loney offers a steady confidence, one that’s short on words but deep in value. Loney’s return answers one of the Rays’ major offseason mysteries. A big question mark still hovers over the baseball world — What will become of David Price? — but Loney’s re-signing means more clarity. Don’t expect the job security and a larger paycheck to change him either. He has hit no worse than .249 (in 2012) since he began his major-league career with the Dodgers at age 22. He produced only 41 RBI with the Dodgers and Boston Red Sox in 2012, but beyond that blip, he has earned at least 65 RBI in six of the past seven years. Then there’s his web-like glove. Loney was part of 1,203 putouts and 115 double plays last season. It was a common sight to see him scoop and skirt low throws from the dirt, displays that built his reputation as a staple of the Rays’ infield. Now, the Rays are guaranteed to enjoy that comfort the next three years. "It’s going to be fun," Loney said. "Those guys (infielders) are great. They take pride in their defense and all the work that they do. The Gold Glove thing is really funny. They probably should just do away with it because I don’t think it’s that accurate." He was AL Gold Glove Award-worthy last season, even if he has no hardware to show for his skill. Instead, Loney and the Rays received something more: The desire to continue their relationship, which preserves the chance for Tampa Bay’s infield to make sweet music again.